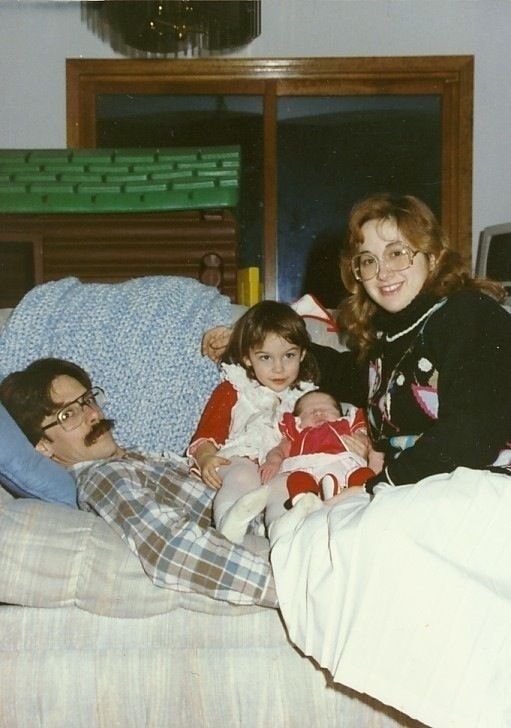 Photo: Family Christmas 1989, our first as a foursome after our youngest daughter was born. She recently graduated from university in April 2012. A fellow who worked for the Peace Corp in the South Pacific office in Fiji once told me that they had done studies that showed a volunteer would have their toughest time at about the four-month mark. It was at that stage in their adaptation to their new situation in a foreign place where they were truly reaching the depths of homesickness. The strongest would endure, powering through it in spite of their emotional turmoil, forever changed by their new lives outside of their full control. While the weaker ones would give up and return home, soaking in their traumatized perceptions, refusing to accept life that isn’t fully predictable. So here I find myself in a parallel space. That four month mark since Keith’s death where I am reaching that first major turning point in my adaptation to life without him. In thinking about this, I was struck by another parallel from our past. It was on September 1st, 1991 that Keith and I arrived with two very young daughters in Fiji. And it was in December 1991 where I found us on that pivotal moment where I would either run back to the states in tears and frustration, or tough it out and find a way to adapt. Back then, in Fiji, the holidays were an amusing attempt to create normalcy on the other side of the looking glass. In the end, we stayed six years, choosing to adapt, and even thrive. But it wasn’t easy. And I find it just a little too synchronistic that Keith would die on September 1st, 2012, 21 years later. Five years before our arrival in Fiji, our first daughter was born two weeks late. She was due on September 1st but chose to wait a couple of weeks longer in the womb. Apparently an Emerson Lake & Palmer concert was finally enough to coax her out. It’s funny (not haha funny) that I am only thinking of this now, that September 1st would be such a day of note in our family history. But then again, I was always amused by numbers and patterns. To this day (for at least the last decade or more), I find myself looking at a clock at just the moment where it reads 9:11. It’s almost as if life is not in balance if I do not see this time upon my glance at the clock. So when the World Trade Center was struck on 9/11/01, the date more than seemed significant. When Keith died, it was 9/01/12. Another dear friend and mentor died on 01/09/10, bit since he was overseas, it would have been written 09/01/10. So maybe there’s a pattern. Or maybe I just like playing with numbers. No meanings inferred here. It’s just interesting. Now here we are on 12/21/12, or even as 12/21/2012.. Interesting rhythm to it. Not quite a palindrome, but a nice pattern nonetheless. Some believe it is the end of the world on the Mayan calendar. But anthropologists say it is what the Mayans say is the end of an “era”, a 13-round cycle of 52 years each. For me, it is just another day. But the end of an era is already here for me. I feel it in my body, physically aching each night as I fight sleep. Days are long, but nights are longer still. Each night, after keeping myself busy with work, school, laundry, family, etc., I come to bed and Keith looks back at me from his photographic perch. In one picture he can look almost stern, mocking my lack of attention to him and my heart sinks. Reality hits me again, like a repeating torturous blow. I kiss my finger and place it on his lips on the photo. “I miss you,” I whisper as I sigh deeply with watery eyes before turning away. And then I face the truth. No, he’s not coming back. No, he’s not out of town. No, he’s not going to walk into the room. No, you will never hold him again while you curl up in this bed. And as another holiday looms, I know that when I come back from our annual service at the soup kitchen where we’ve been cheerfully taking photos of children on Santa’s lap on Christmas Day for 8 years, my home will be quiet except for the two dogs curled up asleep. Keith will not be sitting there with them asking how the event went. He will not be there, ready to open a few presents with the kids, or sit down with us for a meal of whatever we’ve decided to experiment with that year. I don’t like it. I don’t like it at all. And what’s worse… there’s not a damned thing I can do to change it. So, unlike the homesick peace corp volunteer who still has the option of running back to the familiar, I’m going to have to push through it until I get to the other side of this holiday. My husband was a woodworker. And a very talented one at that. I’m beginning to realize that more and more. I guess I took it for granted that others were as meticulous as he when it came to work they were hired to do. Granted he had his off days. But he knew it and more than once he would take a mistake and toss it out starting over again when something didn’t come out exactly as he wanted it to. And, like any talented and meticulous woodworker, he had his tools… LOTS of them, admired by others for the over all completeness of his shop. What makes my role harder as his widow, however, is that not only have I inherited HIS very modern shop. But I also have the project of dealing with the shop and lifetime of items left behind by another woodworker, Mr. Maurice Reid, at Perry Road, the property Keith and I had purchased a year before Keith’s death. Mr. Reid left behind more than 100 years of accumulated tools, supplies, and various pieces-parts of furniture, etc. There were also albums, notes, letters, assorted artifacts going back to the mid-1800s left behind in the 1840s era farmhouse on the property. Fortunately, Keith and I had already gone through much of that, with arrangements made to donate these to a university museum. But the 4000-sq-ft workshop was still chock full of vintage machinery, tools, and supplies. So it shouldn’t surprise anyone that I have begun to sell some items, if only to make way for the art studio that Keith wanted me to arrange for the girls and myself. I even wrote about the first round of sales in a previous post where it felt like a very positive experience. But the more recent effort left me emotionally drained. And after they left, I went to my bed and cried. It didn’t feel right this time. And so, after talking to my daughters, I’ve decided to hold off with any future sales. Both shops are closed to any sales now, especially the kind where people wonder through as if at a garage sale in search of unrecognized treasures. Frankly, it was one thing to see people going through stuff at Perry Road where Keith had only begun to play with the big giant vintage machines to make them his own. But it was quite another to see people I didn’t know touching and talking about equipment in the shop here at home. It was just too painful seeing them playing with knobs, etc. on Keith’s machinery, commenting here and there about it’s failings. I know there was no disrespect intended. And under other circumstances, I probably would have been just fine about it, maybe would have even cracked a joke about it. But this time, as I watched and overheard their murmurings, it took every bit of strength I could muster not to break down in front of them. In the end, after thinking about it for a couple of days, I cancelled the sale of the last two items that would have been picked up in January. I couldn’t go through with it. And the girls convinced me that it was okay to just leave things where they were, even saying that they wanted to use these machines themselves. This last part amazes me. For I often forget how much time Keith had with them working in the shop. They’re much more knowledgeable than I am about the operation of some of these tools. That’s a beautiful gift that Keith gave them… the confidence to handle these tools and make things with their hands. Such are the precious gifts of memories and meaning that are the comfort I seek to get me through this holiday season.